@RepMaloney/TwitterDemocratic Congress members visited an ICE detention facility in Elizabeth, New Jersey, to meet with migrant fathers on June 17, 2018. On Sunday, several Democratic lawmakers made a surprise visit to a detention center in Elizabeth, New Jersey, where migrant fathers are being held, to protest the Trump administration’s “zero-tolerance” policy to separate parents from children at the border. The politicians said they waited more than an hour to gain access to the facility, after Immigration and Customs Enforcement officials attempted to stop them. The representatives spoke with detainees, five of whom were expected to be migrant fathers separated from their children, and live-tweeted the visit. This Father’s Day, several Democratic lawmakers made a surprise visit to an Immigration and Customs Enforcement (ICE) detention center in Elizabeth, New Jersey. In protest, they said the fathers inside shouldn’t be separated from their children. “We are now inside speaking with detainees who were separated from their children when they sought asylum in the US from terrible violence and danger at home,” Rep. Jerry Nadler of New York tweeted shortly after noon ET on Sunday. The publicized visit was meant to draw attention to the Department of Homeland Security’s “zero-tolerance policy” that Attorney General Jeff Sessions announced in May. Under the policy, everyone who attempts to cross the border – even those seeking asylum – are now being prosecuted. Between April 19 through May 31, border patrol officials separated 1,995 children from 1,940 adults, according to DHS figures the AP obtained. The politicians waited more than an hour to gain access to the migrant individuals, according to a tweet from Rep. Carolyn Maloney of New York. At one point, ICE officials reportedly blocked a windowed door with paper, so that the detainees wouldn’t see the Congress members, and called local police. In addition to Nadler and Maloney, Reps. Hakeem Jeffries and Adriano Espaillat of New York, as well as Reps. Albio Sires, Bill Pascrell Jr., and Frank Pallone of New Jersey made the visit, and live-tweeted their efforts. 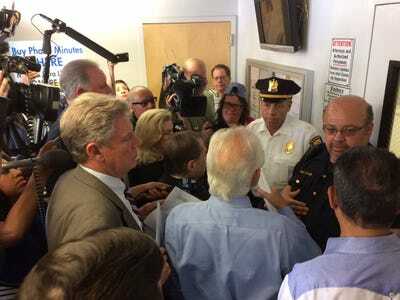 Around noon, three congressional members – Nadler, Espaillat and Pascrell – were allowed in to speak to detainees, Nadler tweeted. They spoke with several people inside, five of whom were expected to be fathers separated from their children. Following the visit, the politicians held a press conference, where they told a few stories about the migrant fathers they met. “They’re like the majority of migrants from Central America who are fleeing violence that has been well documented by the UN Commission on Human Rights,” Nadler told the crowd gathered outside to join their protest. The other members of Congress took to Twitter to call on President Donald Trump to reconsider the policy. Trump has falsely blamed Democrats for enacting the policy. “As @realDonaldTrump celebrates #FathersDay, I urge him to rethink the hardline immigration rhetoric put forth by his Administration that creates an environment of unjust racial bias, distrust, profiling & the separation of families,” Espaillat tweeted.